Value Investing » Investment Terms » Investment Portfolio: What is an Investment Portfolio? What are Different Types? Investment Portfolio: What is an Investment Portfolio? What are Different Types? An investment portfolio is basically a collection of assets owned by an individual or institution designed to grow in value or provide income. Typically, an investment portfolio is well-diversified, and may contain many different types of assets, including cash, real estate, and gold. Most commonly, however, an investment portfolio will contain stocks and bonds whose overall value fluctuates depending on market performance. 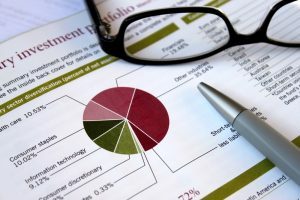 Most individual portfolios contain a wide range of assets designed provide a long-term gain to provide for things like retirement or children’s inheritances. There are several different types of investment portfolios, but this post we’re going to cover three of the major debates when it comes to investment portfolios. Whenever you’re making money, you’re going to have to pay taxes. That’s unavoidable. When it comes to investments, however, the question arises: when do you want to pay those taxes? Some portfolios are taxable or tax-managed. This means that you pay taxes each year on any income you get from those investments or any gains you might make from selling various assets. A tax-deferred account, however, is one that does not require you to pay taxes until you actually start to make withdrawals. Many retirement accounts, such as IRAs, are tax-deferred. This means you can have the IRA for decades before having to worry about taxes. That might sound good, but many people still opt for the taxable accounts, because in this case you’re getting the taxes out of the way now. This makes it easier in many respects to manage and plan your finances. Should you retire wealthy and in a higher tax bracket, for example, you could be paying more taxes in the future than you would now. In addition, certain types of assets are taxed at a lower rate, which means paying the taxes now might be more advantageous. Another major distinction in investment portfolios is whether they are managed actively or passively. You can get a good idea of what that means by the name itself. An actively managed portfolio is a portfolio that has an investment manager whose job it is to buy and sell in an effort to make as much money as possibly. This means that assets are traded constantly. This can be great, if wise decisions are made and the market performs well. However, at the same time, a poor decision or an inept manager can mean losing money. Keep in mind that the investment manager gets paid either way, so some of the money you’re hoping to make goes to pay his fee. A passive portfolio, on the other hand, runs more along the lines of “set it and forget it.” The investments are set up usually to mimic one of the major stock indices (like the S&P 500), and then they are more or less left alone. This is much easier to manage because you don’t have to worry about the day-to-day aspects of trading. In addition, you don’t have to worry about all those fees going to an investment manager. Of course, with a passive portfolio you’re more or less at the whim of the market. A bad week or month (or longer) can mean a significant loss, and while the markets usually recover, you’re still left with less than you could have. You may have heard the often repeated stock market investing advice to keep your portfolio diversified. By diversification, we mean getting exposure to a wide variety of industries and sectors and asset types, so bad performance in few of these assets is counter balanced by good performances in other assets, and the overall portfolio remains relatively stable. The advice to invest in index funds, in addition to it being passive, also hinges on the fact that index funds get you instant portfolio diversification. However, it is counter productive to have portfolios that are over diversified with 100s of names. Beyond a certain point, additional diversification does not bring any more benefit, and only forces you to buy assets that may not be investment worth, just in the name of diversification. A focused portfolio with only a limited number of investments, on the other hand, provides you the opportunity to pick and choose what you invest in. You are also more likely to keep close tabs on the investments and the business performance of yoru companies, if you have a limited and manageable number of them to monitor. Your investment decisions when you run a focused portfolio, are mostly based on the merits of the investments you hold, and are therefore less likely to be at the whims and fancy of the market, and more under your control. I personally recommend investors to have a focused portfolio that only contains their best ideas. At the same time, consider including 10+ stocks (or other assets) in the portfolio that are lightly correlated or uncorrelated with each other. This provides enough diversification to manage the risks in the portfolio, while it also allows you to focus on generating nice profits (as opposed to keeping up with the average market return when you run a diversified portfolio). While your stock broker will administer and report on your investment portfolio for you, you can also set up tracking portfolios on services like Yahoo Finance. This can be very useful if you wish to keep a watch list of stocks for further analysis.